After work I ran to Whole Foods to pick up some groceries. I feel awful for shopping there so often, only because it can be expensive, but there are certain things that I can only get at Whole Foods! I have read some articles that say some foods are actually cheaper at Whole Foods though so that makes me feel a little better. Anyway, along with the regular apples, bananas, spinach etc that I always buy, I tried some new brands! 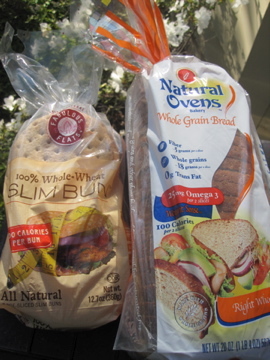 First up: Fabulous Feats 100% Whole Wheat Slim Bums (a version of sandwich thins) and Natural Oven’s Whole Grain Bread. 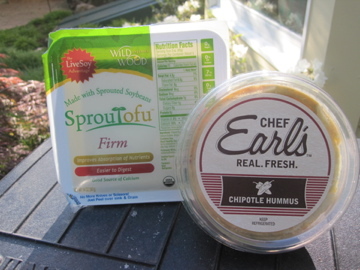 And second, LiveSoy SprouTofu and Chef Earl’s Chipotle Hummus. The sprouted tofu says it’s easier to digest and it was also cheaper than the Nasoya. The hummus came in a whole bunch of interesting flavors, but the chipotle sounded interesting. I had a lick while packing some up for a snack tomorrow and it had a definite bite to it! I’m going to be downing water along with it for sure. 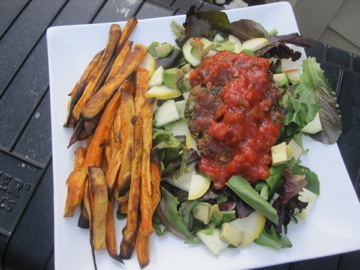 Dinner was an old fav – Anne P.’s Mexican Black Bean Burgers. These definitely fit the bill for a protein-packed meal. I had a little snafu when I couldn’t get the food processor to snap closed, so I ended up transfering the ingredients into the blender. Welllll blenders don’t really like mixing black beans, flour, and spinach so these ended up a bit rustic. Still tasted delicious though! I placed one of the black bean burgers on top of a bed of mixed greens, diced squash, and avocado. 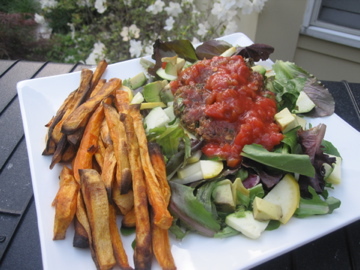 I topped it with salsa and had sweet potato fries on the side. DELISH. And the leftover burger with salsa will be a perfectly festive Cinco de Mayo lunch tomorrow. Yes I planned that. Time for copious amounts of fruit and then bed. Oh, and I made my hair appointment for this Saturday! I’ve not trie any of those products, but the chipotle hummus sounds especially intreguing! Thanks for the reminder that I need to make Anne’s black bean burgers! haha i love your themed eating!!! i always spend a buttload at whole foods but i never knew that some things were cheaper..i may have to investigate this! I haven’t ever tried any of those products! I’ve tried other versions of chipotle hummus-yummy! Those sandwich thins look good! If I remember right the ones I have seen at other grocery stores have artificial sweetners in them. What are the ingredients like on the ones you picked up? I’m totally loyal to Trader Joe’s. I just pretend that it’s totally normal to be completely obsessed with one grocery store. I wish Whole Foods were closer to me! Yum! Dinner looks amazing! And I’m excited to see pics of your new hair- it’s gonna look great I’m sure! the sweet potato fries look delicious! Looks like a power-packed meal!!!!!!! BAM!!!!!! I agree! The fries look yummy! Black bean / sweet potato combination is killer. How did I live without it for so long? Excited to see your new ‘do! I have to mix up my grocery stores too. I go to Whole foods for all my meats and grains and it’s way cheaper than publix since the one I go to doesn’t have bins. Your dinner looks really good. I may have to have that tonight! I loveee Whole Foods! I spend way too much money at that place! I love Whole Foods- a trip there is like Christmas! 😛 I just wish it wasn’t so expensive! !